Which team will become the SunShot Prize Winner offering America’s Most Affordable Rooftop Solar? Driving towards $2 per Watt rooftop system pricing for installations sized between 1 kiloWatt and 15 kiloWatt (kW) by the end of 2014. On the occasion of the SunShot Grand Challenge Summit and Technology Forum, the US Department of Energy (DOE) announced an X PRIZE like competition to lower the average price of small rooftop solar photovoltaic (PV) installations across the United States to $2 per Watt ($2/W) by the end of 2014 with the goals of enabling affordable installations with sustainable business models and transitioning to a post incentive solar market. Sounding a bit like a reality TV series, the SunShot Prize: America’s Most Affordable Rooftop Solar offers a $7 million First Prize and claim to the “SunShot Prize for America’s Most Affordable Rooftop Solar” title to the first team installing a minimum of 5000 systems sized between 1 kW and 15 kW at an average price of $2/W in the 50 US states or territories. The average $2/W system price is pre-subsidy before any federal, state, local, utility or other tax, subsidy, or rebate incentives although the system owner may still leverage these. Like a horse race, the second and third teams will win $2 million and $1 million prizes respectively along with “SunShot Prize Finalist” bragging rights. SunShot Prize: America’s Most Affordable Rooftop Solar program is open for the submission of comments and questions until July 13, 2012, a date less than one month away. Prize Rules will be released and Registration for the competition will open on August 1, 2012. 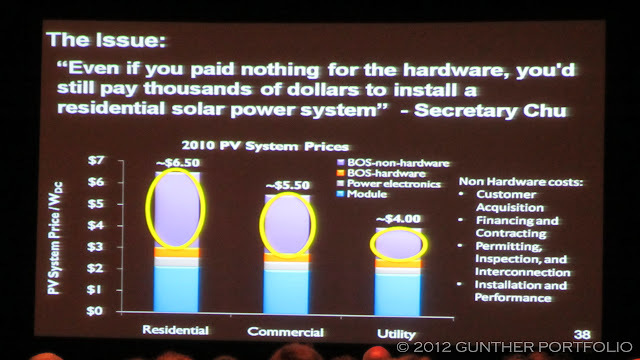 Even if you paid nothing for the hardware, you’d still pay thousands of dollars to install a residential solar power system. The Secretary went on to highlight Germany’s success with a one (1) page Feed-in Tariff (FiT) online registration system for residential PV not requiring permit applications for housing structures built to code. In Germany, residential PV installations cost about $2.50 per Watt and are set to decline further in 2012 once a compromise on planned FiT cuts is reached. 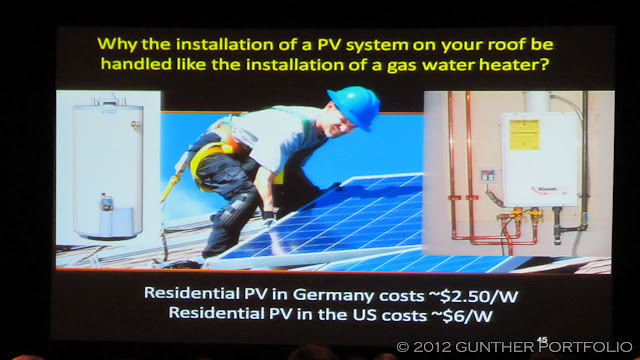 Residential PV should be as easy to install as a potentially more dangerous gas fired water heater not requiring any permits. According to the SEIA/GTM Research U.S. SOLAR MARKET INSIGHT REPORT Q1 2012 Executive Summary, the national average of installed residential system prices was $5.89 per Watt in the first quarter of 2012. The SunShot Prize encourages novel public-private partnerships, original business models, and innovative approaches to installing clean, renewable solar energy. The sustainable business strategies developed by participants will provide transferrable lessons that can be applied nationwide to hasten America’s transition to affordable clean energy in a post-subsidy market. The public-private partnership aspect will be crucial for SunShot Prize teams to reduce soft costs to achieve the $2/W average system price target in almost every US state or territory except Vermont. Vermont has already implemented a statewide one page solar registration form for all net-metered installations sized 10 kW or less. In the Soft Costs Grand Challenge Deep Dive, AllEarth Renewables President and CEO David Blittersdorf evangelized the Vermont statewide solar registration system as a national model to reduce the high and unsustainable soft costs of the existing solar permitting and inspection regimes. Even Vermont has room to improve by moving the form online, perhaps increasing the maximum system size to 15 kW in alignment with the SunShot Prize, and getting the state’s largest city of Burlington on board. Placating and massaging stakeholder interests in an evolutionary fashion will not reduce solar soft costs enough for states or local governments to create fertile environments for SunShot Prize teams to thrive. solar installers, local and state governments, solar manufacturers, electric utilities, code officials, municipal planners, nonprofit groups, financial institutions, institutions of higher education, associations, or other non-profit organizations. Local governments, state governments, townships, municipalities, authorities or any other organization with substantial interest or control by a local or state authority may participate as team member but such an entity cannot be a Team Lead. The SunShot Prize: America’s Most Affordable Rooftop Solar Draft Competition Requirements define high quality systems in the Installation Specifications including performance guarantees estimated from the system design, warranty coverage from manufacturers, total system workmanship, and the installer, and Operations and Maintenance (O&M) contracts. Of course, the systems must meet all local, state, and federal permitting, installation, and inspection requirements, utility interconnection rules and regulations, and use only UL certified PV system components. A few interesting points from the Draft Competition Requirements and FAQ. SunShot wants the formal Submission to include “the full population of installations” eligible for the chosen period to prevent cherry picking. It does appear conceptually possible for 5000 1 kW installs to meet the minimum criteria. I don’t think a SunShot Prize team could have too many $3/W installations and still achieve the average $2/W system price goal. Solar leases or third-party owned systems are eligible and have different metrics if required. SunShot has numerous evaluation criteria to insure the business model is sustainable in a subsidy-free US market. Although it can be delayed 90 days upon request, “DOE will have unlimited rights to disclose and release information about a team’s registration” and plans to compete for the SunShot Prize. Hopefully, DOE’s unlimited rights do not extend beyond the team members to details in the Registration such as the Concept Paper. 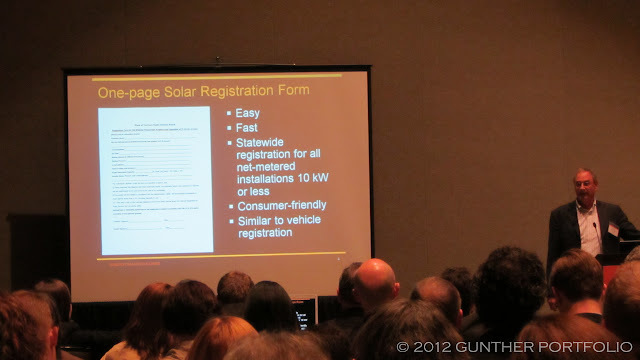 Upon Pre-Submission approval of the registration, SunShot teams are required to submit extensive records in the Full Submission for the SunShot Prize including a detailed installation profile for each of the 5000 installations. Though submitted online, I estimate a complete entry submission may be on the order of hundreds of thousands or millions of letter page equivalents unless duplicate documents can be avoided for the installations. I presume the administration overhead of assembling the SunShot Prize submission does not count against the $2/W solar business model? With complete entry submissions due by yearend 2014, DOE has allocated almost eight months until August 11, 2015, to evaluate submissions via the establishment of an Evaluation Review Committee (ERC) using an approach and methodology that should be made public by the end of 2012. Besides a complete financial audit, DOE plans to conduct random field assessments of about 10% or almost 500 of the installations in each final submission. The business model will get special attention to validate viability and sustainability in the post incentive solar market. The DOE ERC wants to fully vet the SunShot Prize Winner and two Finalists achieved the goals while complying with eligibility, specifications, rules, and submission requirements. What would the goal be for a sequel to the SunShot Prize: America’s Most Affordable Rooftop Solar? 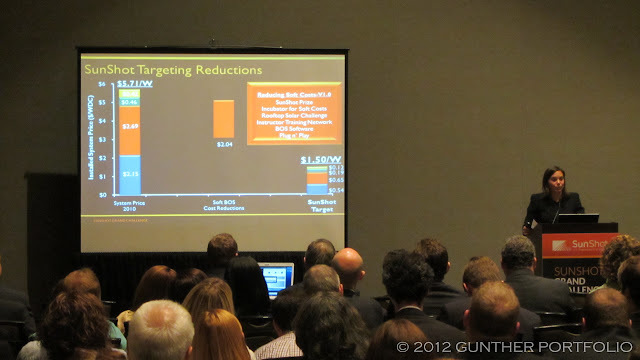 $1.50 per Watt installations per the SunShot Roadmap. Do you think there will ever be an America’s Most Affordable Rooftop Solar reality TV show on HGTV? Or will there just be a PBS documentary about the SunShot Prize? I love the water heater slide. How on earth did they manage to goof up a very interesting point with a gross grammatical error? Cross check much? I don’t know. The slide should go into some sort of solar hall of shmame though. Your bases all belong to us. Hey… maybe the slide might actually get wider distribution for the grammatical error.